I like Emerald better than the orange they had last year. Orange is NOT my color. 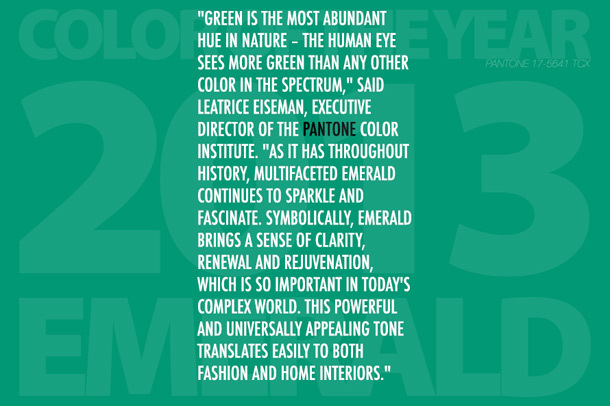 Emerald Green is my favorite color, so I’m kind of excited for Pantone’s prediction. I don’t wear emerald makeup really though, but green clothes look awesome with my red hair. Been wearing emerald clothes so much in 2012. Ha. Yeah, my birthstone! I love emerald green! I really like this colour and look forward to wearing it as an eyeshadow. I instantly went out and purchased green tights after I heard this was the colour of the year. I love Green clothing but not on nails or face… wasn’t a fan of the orange of last year either. That is not what I imagine when one says “emerald”. It is a bit like seafoam green. More tropical than emerald which is usually in the jewel tones. All that being said, it is a pretty color for summer nails. I agree, I mentioned further down that I love emerald green and I’m excited for it to be chosen, but this is much more light and blue/turquoise toned than I picture emerald green. I think of it more like that gorgeous dress Keira Knightley wore in Atonement. It’s a very pretty colour (love the Essie polish in summertime), but how is this emerald? It’s not even close. Closer to turquoise or seafoam green really. Just disappointed that a colour company can get this obvious fact wrong. 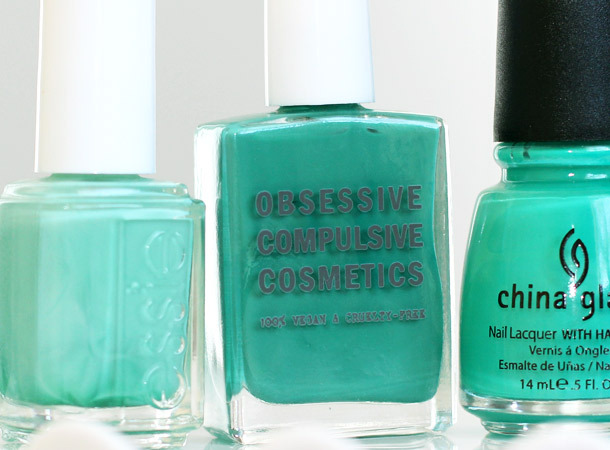 I personally don’t like these polishes; they seem more seafoam green than emerald. And I really don’t like emerald, either. Just my opinion. That’s not usually what I think of as emerald- but if you look at an actual emerald, it’s pretty close. My favorite color is a darker version of this, more of an ivy green, but I love this color too. Looking forward to the sephora+pantone color of the year collaboration with this color! If there’s something out there called a colorgasm, I think I just had one ^^. Oh awesome pick, Pantone. Green is probably my 2nd fave color, next only to gray! 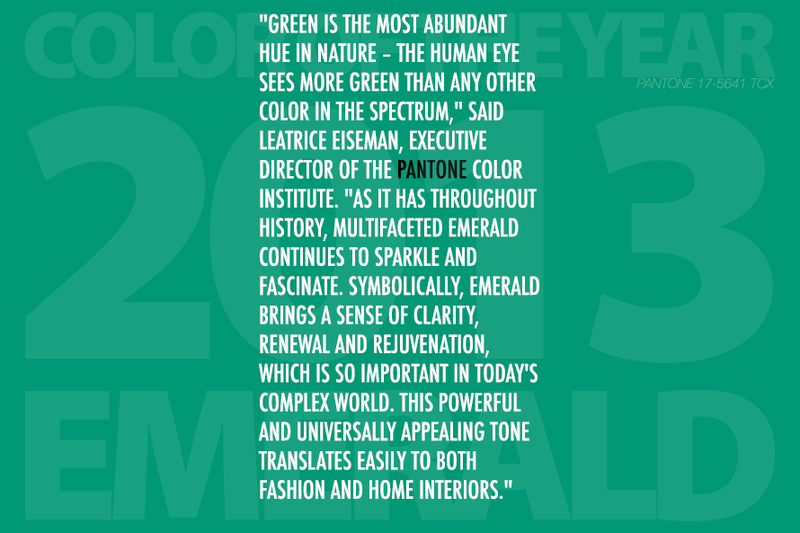 I’m way more excited about this than the tangerine shade chosen for 2012 – emerald green is GORGEOUS. Good choice! Can’t wait to see the stuff that comes out in honour of this pick in the next year.